Develop an effective off-season workout routine. Take your kid to NFL or collegiate games. Watch last season’s games on tape and look for areas for improvement. Attend a youth football camp. These camps are probably the best way to help children prepare for the upcoming football season. Click for the Ultimate Youth Football Parents Guide. 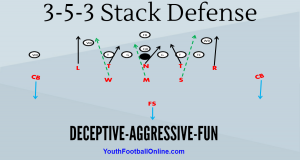 This guide is a must have for all youth football parents! The body only works well when it has healthy fuel (or food). It is especially important for your child to eat well before all games and practices. If not, it will show on the field. Sports and energy drink marketers would like you to believe sports and energy drinks are what athletes should drink for hydration-water will do the trick! Water is the most abundant, yet the most overlooked, substance in the body. To ensure proper hydration, drink water before, during and after every work out. Drinking enough water is essential for a youth football player’s performance. Hydration is commonly overlooked, especially at the youth level. Since kids are so physically active, staying hydrated during their youth and teenage years might be even more important than keeping hydrated at other times in life. Staying hydrated during intense physical activity is crucial for getting the most out of practice and work outs. Hydration is also necessary for preventing cramps, fatigue, dizziness, and overheating. The human body is like a car. We all know that an engine cannot run properly without enough oil. Water is like the oil for a car engine. If the athlete is not hydrated properly it can lead to complications. Dehydration can cause temporary, and sometimes even permanent, damage to the body. Coaches and parents should make sure the kids are hydrated before, during, and after all physical activities.